The WWI Wednesday series, which I began to I present a peek at the WWI we don’t normally see in pop culture, has resulted in just as many surprises for me as it (hopefully) has for you! 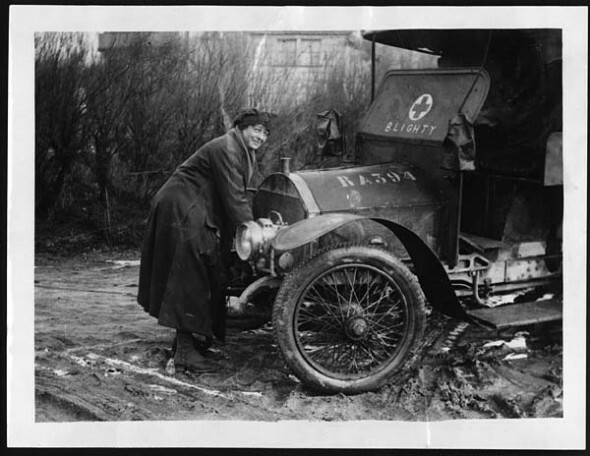 My favorite find has been the story of the ambulance corps made up of women drivers, who dared much by sitting behind a steering wheel or fixing their own engines, not to mention their harrowing experiences driving quite near the front lines. 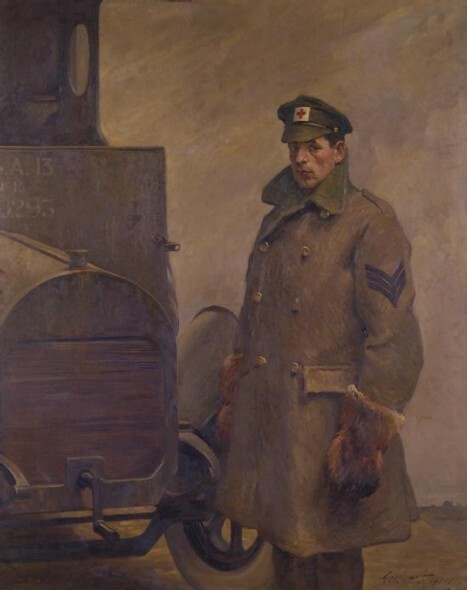 After reading as much as I could about them–and the British corps in particular–I couldn’t not write a novel featuring an ambulance driver. How could I let that opportunity pass me by, right? 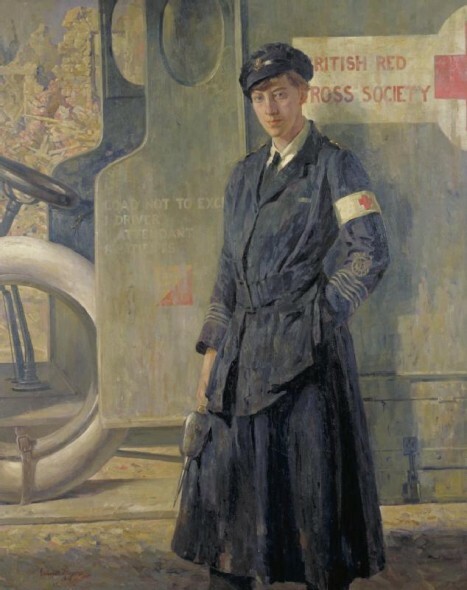 😉 Surprisingly, women ambulance drivers could be found in various fronts over the course of the war, and the corps were kitted up by women from various nations and walks of life. In the early 1900s, driving an automobile was an act of independence and privilege, and without going into any scholarly depth (I’ll leave that to this book), a woman driving an automobile in the early 1900s exercised her ability to go wherever she wanted when she wanted. This was an undoubtedly terrifying specter in the era of militant suffragist demonstrations, and the resistance towards women stepping outside of their “place” forced women ambulance drivers during WWI to carefully navigate their roles as “helpmeets” (proper femininity) with their “masculine” positions in the thick of the war. At the outbreak of war in August 1914, preparations for transporting the sick and wounded were better suited for the Boer War of twelve years before: horse-drawn ambulance waggons! Indeed, the First Aid Nursing Yeomanry was founded in 1907 for the purpose of sending nurses mounted on horseback to reach the wounded where ambulance waggons would be too slow to respond. The earliest weeks of war were to shatter these glorious ideals, and motorized ambulances quickly replaced the antiquated notion of a horse-drawn ambulance waggon across the Western Front. The aspirations of the FANY Corps–under the helm of the bold and audacious Grace McDougall (later Ashley-Smith)–to transform themselves from a mounted unit to a motor unit were thwarted by the British Army, who were loath to have women involved at the Front in any capacity other than trained nurses. Granted, their prejudice derived just as much from pre-war assumptions of a woman’s proper sphere as it did from the multitude of “helpful” ladies who flocked to France and Belgium to establish hospitals without any jurisdiction from the medical and government authorities. As a result, most, if not all, women’s ambulance units served the Belgian and French Armies for the first two or three years of the war. Joining the FANYs in Belgium were the Munro Ambulance Corps, a unit put together by the slightly eccentric Dr. Hector Munro in August 1914. Dr. Munro advertised for “adventurous young women to equip an ambulance unit for service in Belgium,” and of the 200 applications he received, he accepted four: Lady Dorothie Feilding, Mairi Chisholm, Mrs. Elsie Knocker, and Helen Gleason. May Sinclair, a novelist, joined in a purely administrative role, and there were two doctors, and two London bus drivers who drove the Daimler and Fiat ambulances, along with a few other people. The steady march of the German army across Belgium pushed the Belgian Army back towards the tiny tip between Nieuport and Ypres–the scene of much bitter fighting between 1914 and 1918–and swept the FANYs and Munro units into its tide. before that all the kits belonging to these men were to be sent to Ostend as a measure of precaution. One of those “decisions in blinkers” which cause such infinite suffering. In 1916, the FANY Corps finally won the battle to become the first women’s ambulance convoy to work for the British Army. That same year, no doubt for the same reason the FANY were sanctioned by the British (the need to free up more men for the army) as well as the rivalry between Grace McDougall and the head of the V.A.D., Katherine Furse, the Voluntary Aid Detachment motor ambulance convoy was established. In mid-1916, the Women’s Auxiliary Army Corps (later Queen Mary’s Auxiliary Army Corps, or Q.M.A.A.C.) “formed a motor branch under Miss Christobel Ellis, who had driven an ambulance for the French Red Cross.” As an aside, class distinctions remained even these volunteer units–the FANYs prided themselves on their more aristocratic roots (particularly since their members needed enough personal wealth, or access to wealth, to purchase their own uniforms, ambulances, and other kit), whereas the WAAC, which was formed to send women to perform as cooks, cleaners, and other menial tasks for the British army, was of a humbler stock. Life as an ambulance driver wasn’t glamorous or filled with heart adventure, and many of the FANY in particular were involved in air raids, shelling, and accidents. Pat Beauchamp Washington was sidelined in early 1917 by a collision between her ambulance and a train, which cost her a leg. Fraser [a member of the unit who was seriously injured during a raid]…was coming home from a job, when the bombardment started again and a bomb dropped in front of her, seriously injured the orderly, and hit her in three places. She had just passed a hospital, so managed to struggle back there, and tell them to fetch the orderly. She was operated on next morning, but the man died during the night. She was hit on the arm and leg and had a piece enter the liver; but she is wonderfully well considering, and they hope to be able to move her soon. She was decorated with the Croix de Guerre with palm, and next day with the Legion d’Honneur, a decoration which very few women, and still fewer Englishwomen, have. — Letters of Mrs. Homersham, a FANY ambulance driver. Lady Dorothie Feilding was another highly decorated ambulance driver, earning the “1914 Star, the Croix de guerre from the French, the Order of Leopold II from the Belgians”, and the Military Medal from the British by the end of the war. There was the time of the first serious Zeppelin raid on London, when amid the crash of falling bombs and the horror of fire flaming suddenly in the darkness, the shrieks of the maimed and dying filled the night with terror and the populace seemed to stand frozen to inaction at the scene about them. Right up to the centre of the worst carnage rolled a Green Cross ambulance, from which leaped out eight khaki-clad women. They were, mind you, women of the carefully sheltered class, who sit in dinner-gowns under soft candlelight in beautifully appointed English houses. And they never before in all their lives had witnessed an evil sight. But they set to work promptly by the side of the police to pick up the dead and the dying, putting the highway to order as calmly as they might have gone about adjusting the curtains and the pillows to set a drawing-room to rights. The Transport Corps under the Women’s Legion soon included dispatch riders and Royal Flying Corps drivers (taken over by the Royal Air Force in 1918), and served with the Q.M.A.A.C. Transport in France for the duration of the war. After the Armistice, women ambulance drivers remained behind to assist in the devastated war-torn areas of France and Belgium, and the FANY were tasked with retrieving prisoners of war from the various prisons across the Rhine. Women war workers were all demobbed by the spring of 1919, and they undoubtedly found life had changed for themselves and for British society after four years of chaos, carnage, and courage. Though their contributions to the war were often marginalized in the interwar period, the inroads the ambulance drivers–and munitionettes, nurses, surgeons, farmers, WRNS, etc–made during WWI laid the foundation for an even greater contribution for women during WWII. But let us not leave unsung the many men who served their country–or volunteered to serve another–under similar harrowing circumstances as their female counterparts. Contrary to common perception, the Voluntary Aid Detachment was not only for women. According to a BRCS handbook published in 1915, a proper men’s detachment consisted of one commandant, one medical officer, one quartermaster, one pharmacist, four section leaders, and forty-eight men, of whom were required to be thoroughly trained as stretcher bearers and to some extent, as male nurses, with others hopefully being skilled clerks, carpenters, and mechanics. Their principal duties consisted of “carrying sick and wounded by stretchers and, when necessary, in preparing means of transport by road or rail, in converting local buildings into temporary hospitals, and in disinfecting buildings, etc.” Before the United States entered the war in 1917, the extensive ties between wealthy Americans and European society encouraged many expats as well as those still in America, to fund ambulance units. Many American men jumped at the opportunity to help the Allies in this fashion, and soon they too found themselves in the midst of a great war. Fantastic post Evangeline! Will share. Don’t forget the drivers in the Scottish Women’s Hospitals! Great post! Three years ago I had been very interested in the growth of national ambulance services, in a post called Red Cross, Red Crescent, Red Star of David. I even found a stunning photo of women ambulance drivers in France in WW1. But my women looked strong, competent and well accepted. I had no idea that The First Aid Nursing Yeomanry (FANY) aka Princess Royal’s Volunteer Corps had such a struggle to be accepted. I probably thought that the army would have been grateful for more women being involved, releasing men for the real task of war – fighting the enemy. Yet.. yet… attitudes do eventually change. “Women war workers were all demobbed by the spring of 1919… Though their contributions to the war were often marginalized in the interwar period, the inroads the ambulance drivers–and munitionettes, nurses, surgeons, farmers, WRNS, etc–made during WWI laid the foundation” for later contributions. How important was this! You’re welcome, Hels! It was never more apparent that WWI laid the foundation for WWII than now, as I’m reading two non-fiction books about England between 1938 and 1940. Elsie and Mairi Go To War is a wonderful account of two amazing women. Great post.